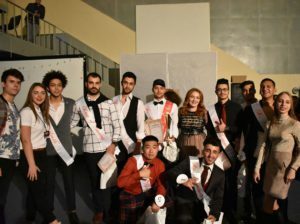 On November 7, the regular INTERNATIONAL MISTER KPI 2018 took place. This year, 9 participants from 7 countries decided to take part in a contest of beauty and talent among foreign men who study at KPI. The following countries were represented: Ecuador, China, Lebanon, Jordan, Egypt, Iran and Turkey. Theme of the current event was: “Street Dance”. Men competed not only in street dancing, but also have shown their talents and ability to stay on stage. For the first time in the history of the competition, not only the jury and the audience, but also Internet users could choose winner of Mr. KPI 2018. After all, many friends could not come to us for a holiday, because of their studies in other cities and countries. So, Mister Internet got the title Mashhadizadeh Hassan from Iran, Mister spectator sympathies title - Kaya Umut from Turkey, and INTERNATIONAL MISTER KPI 2018 became Turkish citizen Atesh Chagan this year once again. More photos and videos from the event on our Facebook page.